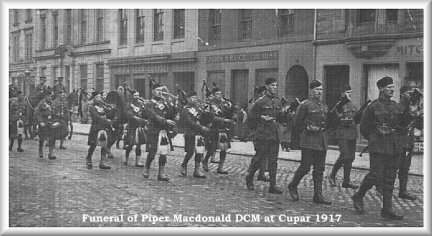 Alexander MacDonald DCM – The Fife Post………..for genealogy and historical information. For the last number of years I have been compiling my Scottish family history – in particular the family of Robert MacDonald and Mary Harris who married at Bleachfield of Blebo in the Parish of Kemback, Fife, in December of 1881. They had a large family, ten sons and three daughters. One son lived just two days. Alexander was their sixth son and he was born at Falkland Wood on November 14 1890. I do not know anything of his childhood. On 4 January 1909 at the age of 18 years, he enlisted at Dundee with the Black Watch. Alexander was a piper with the 2nd Battalion. In September of 1915 the Battalion was present in France to fight at the Battle of Loos. He was awarded the DCM and the Wauchope medal for gallantry at Loos. He was injured in the Battle and as a result he lost a leg. He returned to Fife and was discharged from the Army. For conspicuous gallantry. 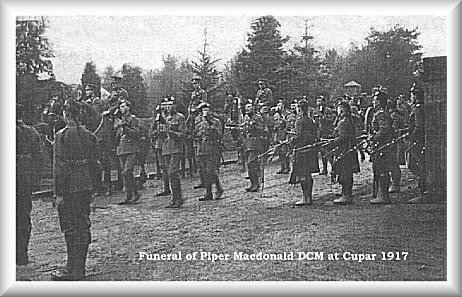 He played his pipes through the first and second enemy trenches, and when the bombers advanced to the third trench, he continued playing at their head, his companion piper being killed at point blank range. (BW DCM Citations 1914-20). The companion piper was David Simpson and a poem written in honour of David was later published. It was called ” The Piper of Loos”. A poem was also written for Alexander, it was called “Another Fife Hero”. In March of 1917 Alexander mar ried Annie Simpson. The civil marriage took place at Edinburgh. Annie, a dressmaker was aged 28 and Alexander aged 26. Less than three weeks later, Alexander was admitted to Adamson Hospital, Cupar and sadly he died following surgery for appendicitis on April 16 1917. He was given a military funeral with the Black Watch pipers and firing party in attendance. 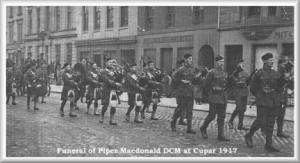 The procession moved from the gates of Adamson Hospital and along streets in Cupar. He was buried in Cupar New Cemetery, plot H grave 442. A memorial was erected to him by the Commonwealth War graves Commission. A very sad ending to such a young life. When I received the details of Alexander’s place of burial I was surprised to find that the address given for his wife Annie was a New Zealand one. In fact it was the address of Alexander’s oldest brother Robert. I do not know if Annie remained in New Zealand or if she returned to Fife, or wether she remarried. I have often wondered what happened to the DCM and the Wauchope medals and who has possession of them now. Of the children of Robert and Mary Macdonald, eight of them came to New Zealand to live and only one, David remained in Scotland. Three sons were killed in action in WW1 and the youngest Neil, was accidentally drowned while serving in Syria with the Australian Army, in 1941. Five sons had served with The Black Watch. Today I received a first letter from Flora Chisnall in many years with an update to her story, that I published here a good while ago, many thanks Flora. Since writing this I have discovered the Annie gave birth to a son Alexander, in December 1917 and in June 1920 he and his mother left London on the ship SS BORDA. The ships destination was Australia but Annie and Alexander must have come on to New Zealand. Annie’s parents and siblings were also aboard the ship and they remained in Australia. Annie died in Wellington hospital New Zealand aged 51 years. Her descendants live in Australia.